KIEV, March 22. /TASS/. 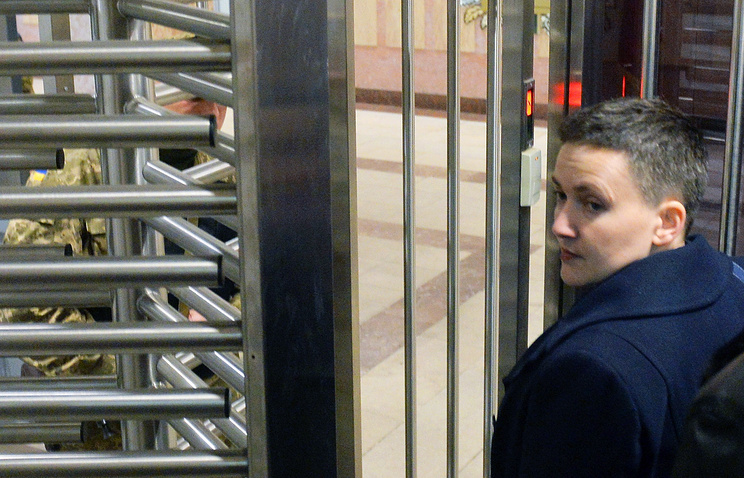 Ukrainian MP Nadezhda Savchenko has been detained in Kiev. Earlier in the day the Ukrainian parliament has upheld three requests from Prosecutor-General Yuri Lutsenko for the indictment of parliament member Nadezhda Savchenko and for her detention and arrest. The decision to strip Savchenko of immunity was carried by a 291 majority vote. Her detention was supported by 277 legislators, with 11 opposing it; 268 voted for her arrest, and six, against. Lutsenko said before the voting that "on the list of top priority investigative measures to be taken today an order to take Savchenko for psychiatric examination is number eight." "This will answer all questions," he said. 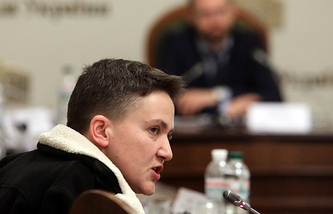 In her final statement Savchenko said that Ukraine should reform its political system and give voters a chance to revoke legislators and hold referendums. "Ukraine does have a way out without terrorist attacks and other problems that may ruin it. There is a simple and legal way - a reform of the political system," she said. At least a hundred picketers supporting Savchenko, including her sister Vera and mother, gathered near the Ukrainian parliament. They were chanting "Nadya is a hero" and "Freedom for Nadya." Some were seen crying.